Loggerhead turtles are the most abundant of all the marine turtle species in U.S. waters. Their distinctively large head and the reddish-brown color of their carapace makes them easy to identify. Loggerheads are one of the largest of the hard-shelled turtles and their range is enormous, encompassing all but the most frigid waters of the world’s oceans. 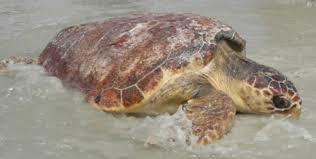 In the Atlantic Ocean, the greatest concentration of loggerheads is along the southeastern coast of North America and in the Gulf of Mexico. As adults their shell reaches an average length of 3 feet and they weigh around 250 pounds, however the largest specimens recorded weighed in at over 1000 pounds! Loggerheads are primarily carnivores, munching jellyfish, conchs, crabs, and even fish, but they will eat seaweed and sargassum occasionally. They have a string jaw which is adapted well to crushing the the hard outer shell their favorite treats. This species of turtle has a low reproductive rate as sexual maturity is reached between 17-33 years of age. The female will lay 3-4 clutches of around 115 eggs every 3-4 years, it is estimated that only 1 in 10,000 of these hatchlings survive into adulthood. 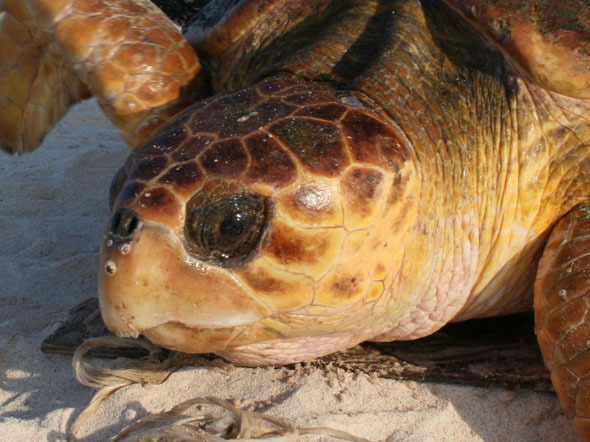 Loggerheads are listed as an endangered species. The population decline is a direct result of pollution, poaching, shrimp/fish trawling, and development in their nesting areas. Males turtles never return to shore after hatching and females only returning during nesting intervals, therefore it can be very difficult to accurately gauge a species total populations.